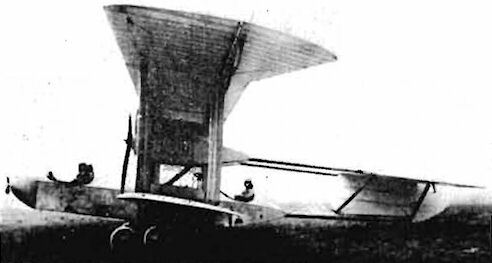 Looking more like an amphibian than a landplane this Canadian Curtiss Twin (two 100-h.p. Sturtevant watercooled eight-cylinder Vees), sometimes called the "Twin Canada" - was tested at Farnborough in 1916 (serial 3700). The three-seater was given an adverse report and the contract for one hundred (R.N.A.S.) was cancelled (serials 9500-9599). Maximum speed 78 m.p.h. ; span 42 ft. 8 in. ; length 28 ft.